The Dragonfly has been throughly field-tested in Australia, where it sucessfully exterminated all varieties of mosquitos, including those carrying Ross River Fever, and sand flies. The Dragonfly is the best solution to control the nuisance of blood seeking insects in your personal space. By using the Dragonfly you can effectively minimise the risk of disease carrying insects biting you and others. Like a bloodhound the mosquito has a keen sense of smell but poor eyesight. It can smell you from 100 feet away, but can not see you until 30 feet away. Dragonfly is a patented insect control system with a microprocessor controlled lure, which emits precise amount of CO2, a thermal lure (simulating body heat), and specially designed electrostatic panels, which destroy the insects. 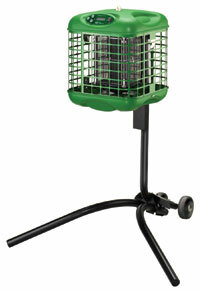 The Dragonfly can be suspended from a beam or ceiling or for maximum portability, placed on a specially designed stand. The Dragonfly is an excellent product for large outdoor eating and entertainment areas. The Dragonfly is available in two models; The Dragonfly Hawker and The Dragonfly Darter. The Dragonfly has been thoroughly field-tested in Australia, where it sucessfully exterminated all varieties of mosquitos, including those carrying Ross River Fever, and sand flies. The unit also provides protection to golf courses, residential areas and children's play areas etc.